I went to Tijuana, Mexico a few times when I lived in California. Reading signs and communicating with other people was not a problem for me there, because I had a good understanding of the Spanish language. It was quite a different experience for me in Japan a few weeks ago. I couldn’t read the Japanese characters, I didn’t understand what others around me were saying, and I couldn’t communicate with anyone (unless they spoke English). When people had conversations in Japanese, all that I heard were melodic sounds with no specific meaning. Linguistically challenged, I felt lost without language! 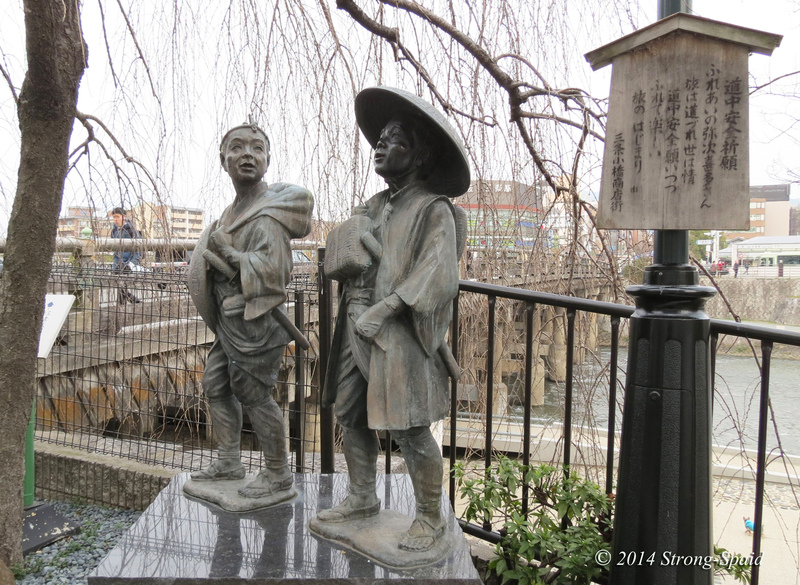 Needless to say, that is why I smiled when I saw this statue of two travelers. I immediately felt an affinity for the little one on the left. Walking with eyes filled with wonder and amazement, mouth open and about to accidentally bump into a tree—this stone image personified my state of mind perfectly. So many wonderful things to see and impossible to take it all in! Notice that there are words written on a wooden sign hanging next to the statue above. It could be an explanation of the two images or a road sign. I know I was in Kyoto, but I don’t remember the name of the bridge or the river in the background. (I’d be a terrible tour guide, I know). Anyway, I soon realized that there is another aspect of daily life where language is extremely important: FOOD. 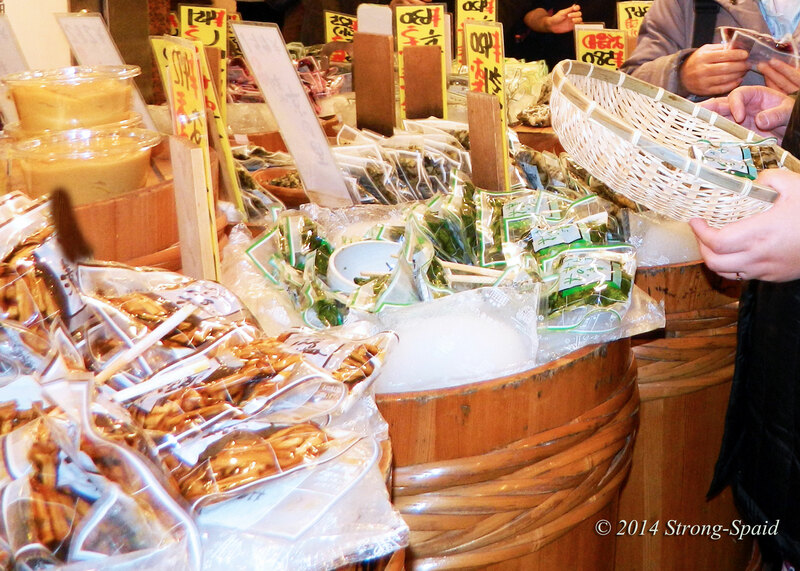 At the marketplace in Kyoto, there were many vegetables, fruits, fish, and desserts that I did not recognize. Unable to read things like names, labels, or expiration dates—how would I know what to buy, or how to cook or keep the food stored? My Japanese friends can speak English, but I didn’t want to be like a preschooler driving them crazy with CONSTANT questions. As soon as they could have answered one question, I would have had a gazillion more! So, instead of buying anything, I decided to take photos of all that I had never seen before (which was clearly marked with large signs that I couldn’t read). 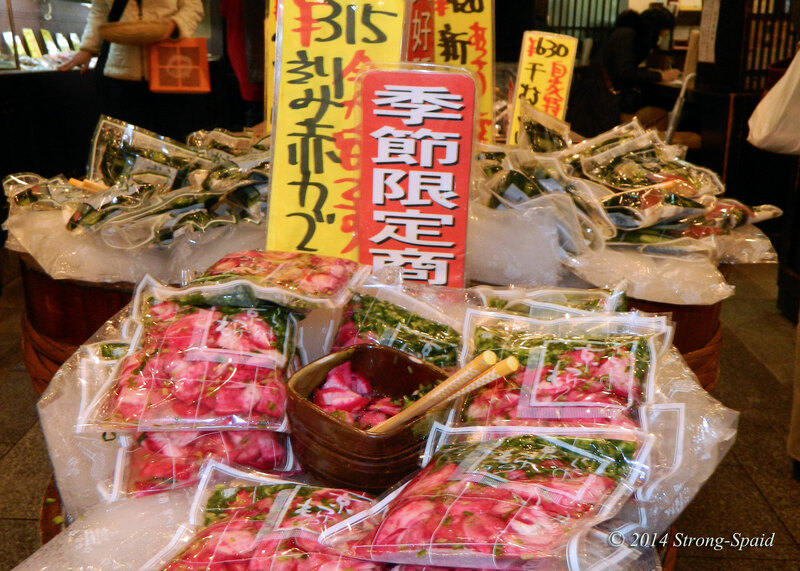 The vegetables, whatever they were, looked so fresh and healthy! In addition to fresh vegetables, there was colorful food wrapped in tight packages that seemed to be attracting a lot of attention. Must be good! 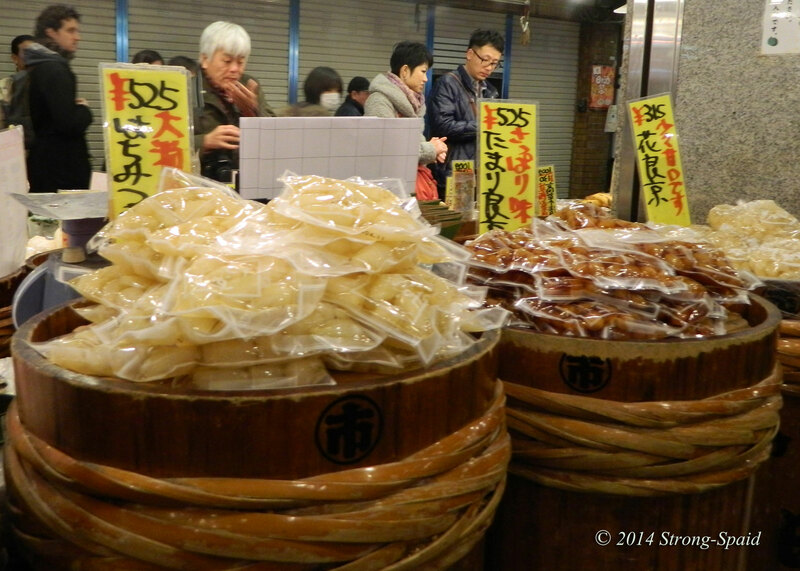 People were smiling, talking, and joyfully buying all kinds of edible delights, as I watched with great interest. In case you haven’t noticed by the tone of my writing, I was quite frustrated with my inability to comprehend the Japanese language. So, it was comforting to occasionally look up and see a store name written in English! Yes! I was always happy to see something that I was capable of reading, but “Tofu Doughnuts” is a rather disconcerting thought. American doughnuts are deep-fat fried balls of flour dough and tofu is known as a health food, so trying to combine the two words in my mind was difficult. A healthy doughnut? I didn’t buy one that day, but now I wish that I had. 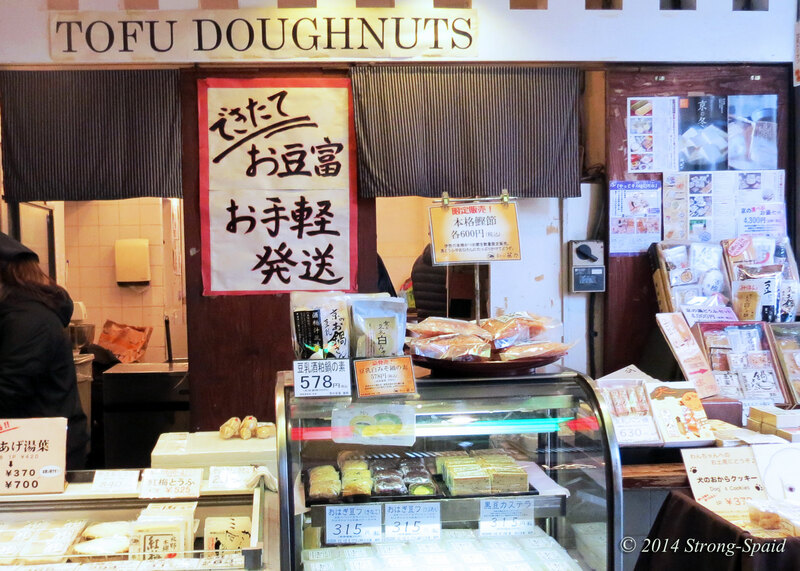 I don’t know exactly how a tofu doughnut is made or what is in it, but it would have been interesting to see how it tasted. By the end of my short stay in Japan, I had come to the conclusion that language is more important than any other academic field of study. The inability to read and/or communicate adequately with others is a huge barrier to any other endeavor. Truthfully, I have been thinking about the Rosetta Stone language CD courses for quite a while. Has anyone ever studied a language using Rosetta Stone? 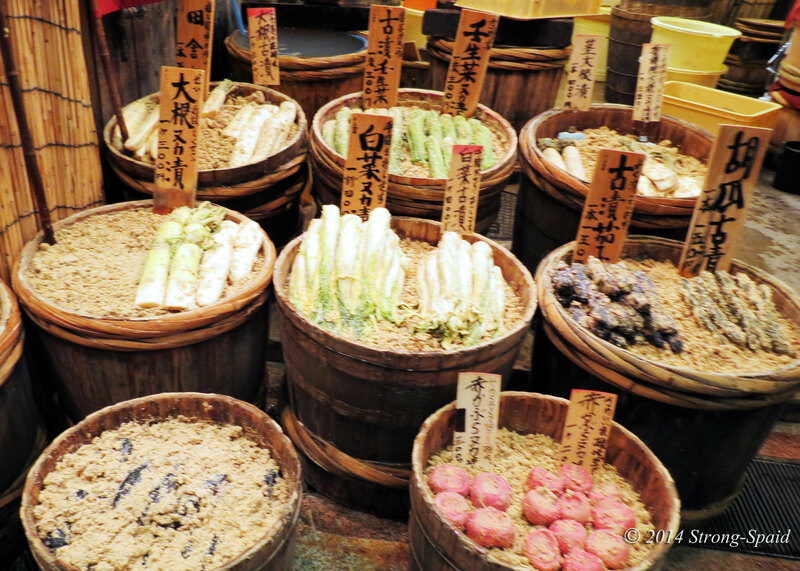 This entry was posted in food, Photo Essay, photography, Travel and tagged communication, Japan, Kyoto. Bookmark the permalink. Not Rosetta Stone, but for Japanese, try NHK online. Thanks so much for the advice. I had heard that Rosetta Stone was better suited for learning European languages, but not so good for Eastern languages like Chinese, Japanese, Vietnamese, etc……because the “sentence structure” is not the same? Mary, love this post and love that you channeled your frustration into taking photos 😀 You are so right about the study of languages being incredibly important. On my bucket list is to learn French, and I did use Rosetta Stone for awhile. I particularly enjoyed having the online tutorials and the mobile app, but the aspects of those that I most enjoyed were part of a monthly web subscription and the price added up. Alas, life’s obligations then got in the way and it’s been quite some time since I last used it. I take it you wish to learn Japanese? I have a good friend who is Vietnamese, some other friends who speak Mandarin Chinese, my next door neighbor speaks German and English, and it would have been nice if I could have understood Japanese while I was in Japan. Actually, I would love to speak every language, but I would have to live a few hundred years to do that…or study through several lifetimes! I was so overwhelmed by what I did not know in Japan, after I came home….I slept for about 2 weeks. We felt lost when we were in the Czech Republic, in Prague. My partner (who can speak and read abit of German) couldn’t even guess the street signs because their alphabet is different. Just like Chinese/Japanese :). Suddenly, back to being 3 years old again….feeling totally dependent on everyone for everything. Where am I? Where am I going? What is this? What is that? WHY? How? Are we there yet? Celsius? What is the temperature in fahrenheit! It’s so disconcerting to be in unfamiliar surroundings, unable to understand or communicate. I was in Russia, when it was still the USSR, and walking around Moscow, taking the subway and trying not to get lost amongst signage in cyrillic and a humanity that spoke nothing but Russian, was a tad intimidating. I teach Italian and many students have told me Rosetta Stone is useful for basic conversation but it’s hard to make the leap beyond it. Also, as someone mentioned above, it is expensive. Yes…intimidating is right! Life is rather overwhelming without the ability to clearly communicate with others. Now at least some cell phones can be set up with global capabilities…so a call home could be made if necessary. Speaking of which, I arrived home from Japan on the same day the Malaysia airline flight vanished. I was hoping someone with a cell phone would make a distress call from that plane, so others would know what was happening. 3 weeks have gone by now and still nothing. So terribly sad! I spent 24 hours in Japan and used charades, it kind of worked for me. Lol. Hahaha…I would have loved to have seen that! Yes! And I kept making mistakes with my shoes. I would remember to take them off when I would go inside somewhere, but when it was time to leave… I kept putting them back on too soon. Did she ride on the commuter trains? Oh my. That was an experience. I was afraid I was going to get lost in the crowd!! Being in a country where you don’t speak the language is sort of how it is to be hearing impaired. You nod, you smile, you might get the drift of one or two things….but mostly you are watching and trying to figure things out by the visuals and a few key words. By the end of the day you are exhausted from paying attention. OH….that’s the feeling exactly! By the time I returned home, after only 10 days of trying to pay attention to things I could not understand, I went to bed for about 2 weeks ( got up only for a few hours each day). I am still tired…..Amazing! Wow. Amazing post, stunning photos! Thank you for sharing! I could relate to so much of what you were saying, Mary. There’s something quite frustrating about not being able to communicate or know what’s surrounding you. We felt that way so strongly during our first few months in Korea, but over time things get easier. I think the most interesting thing about not knowing the language of a culture is how much can be communicated through our gestures and tone. I’m always shocked at how much I understand just through those things alone. Suffice to say that my husband and I have wished we knew the local language on more than one occasion, but aren’t quite willing to dedicate the time it would require to learn. I don’t have any personal experience with the Rosetta Stone series, but have heard good things about it. Learning another language would definitely be an amazing feeling! LOL brought back memories of my time there. I was there for a study period with the church, and of all the attendees we were only 4 speaking English, we had someone who had to interpret everything for us. I was very surprised at just how little English was spoken away from the main cities, and even there, Japan is a world on its own, there is little need unless you are in business to learn to speak English. What I also found interesting is that when I talked of learning the language (basics) with my Japanese friends (here in Canada/USA) they really didn’t think unless I was going to be living there, that it would be useful. They all took great pains to tell me of all the differences and nuances in the language and how easy it is to make huge errors. So different from reactions to learning other languages, mind you I was younger then, and now it is true, the likely hood of my taking another long journey like the one to Japan, unless like last time it was needed to further my calling in the church, I doubt I would do it again. did you succeed in your search to learn the language? Beautiful photos of the food and the interesting statue, maybe someone will recognize it one day. I hope so….I would love to know what it says! Wonderful photos and the contents of this post. Some languages are to me problem also, although I can speak 6 languages in addition to my own mother tongue. Happily, new languages can be learned quite easily in our modern days due to Internet. My newest language is Portuguese and I listen to direct radios and see direct tv-shows from Brazil. In addition to these two easy methods, I read news also in Portuguese. To deepen my language knowledge, I have already read three books in Portuguese using dictionary. So, this is my way to learn new languages. All of those languages…that’s quite an accomplishment!